As they struggle to keep pace with the Boston Red Sox atop the AL East standings, the New York Yankees are shaking things up in their bullpen. Yankees manager Joe Girardi announced Saturday that Aroldis Chapman has been removed from the closer’s role. The change comes one day after Girardi scolded Chapman in the middle of an inning, in part because he didn’t back up home plate after yielding a two-run single. 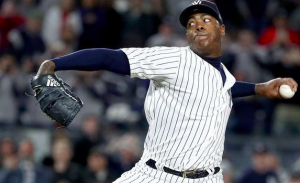 Chapman has struggled since coming back in mid-June following a six-week stint on the DL because of a rotator cuff injury. Since coming off the DL, Chapman’s ERA has risen from 3.55 to 4.29. Things have been particularly bad for Chapman over the past week. He’s given up seven runs over 4.1 innings across four outings. The Yankees have lost two of those four games, both to the Red Sox. But Girardi has seen enough from the Cuban lefty. The manager doesn’t want to see Chapman blow any more saves until he gets things turned around. Girardi says that either Dellin Betances or David Robertson could be used to close games. Betances served as the closer while Chapman was on the DL earlier this year. He’s saved 29 games for the Yankees over the last three seasons, including eight this year. He’s posted a 2.15 ERA this season and has been almost un-hittable since the all-star break. However, Robertson, who was reacquired before the trade deadline, spent three-plus seasons as the Chicago White Sox closer, making him the more experienced option. He also has a 1.23 ERA since being traded to the Yankees. Girardi appears comfortable using either one to close out games and is open to either claiming the job as his own. Meanwhile, Girardi says that Chapman won’t have a defined role for the time being. The lefty will be used however Girardi sees fit. Girardi made it a point to say that Chapman has a chance to work his way back into the closer’s role. But with winning being valued above all else, the Yankees should be in no rush to put him back there. With pitchers like Betances and Robertson, the Yankees are still in good shape at the back end of their bullpen. Those two could make it difficult for Chapman to earn his way back into the closer’s role before the end of the season.